I’ve got my first block done for the Vintage Revival Block Along. I have all the fabrics picked out for a mini spiced chai quilt from the book, but I didn’t have time to get to them because I was feverishly working on my barn door quilt along last night. But, I did get my first block done for the geometric slide quilt. I’m going to make the full quilt for this project as part of The Library Project for this year, and even though I only have one block completely finished, I feel like I made pretty good progress since I did get all the fabrics cut for the quilt. They’ll have to chill out for a little bit until I’m done with barn door and star light star bright quilt alongs, but this is a project that I’m going to be glad to return to. I couldn’t resist the temptation to see how the block was going to look once it was set into the background fabric (I’m using Kona Yarrow as my solid if anyone is curious). Here is the quilt teaser in all its blurry forced indoors for the winter glory. 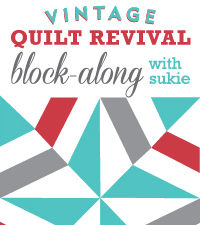 So, I’m a little sad to put this project aside until March or April, but at my consolation prize is moving on to some more blocks from Vintage Quilt Revival , and there is no shortage of projects that I want to attempt in the book. I’ve already figured out most of the cutting plan for next week. Fingers crossed that I can fit it between quilt along activities. This entry was posted in quilting and tagged quilt, quilt alongs, vintage revival. Bookmark the permalink. ← Toning up Thursday…are we there yet? I love your bright background choice!!! I hope you enjoy the book! There are a few errors introduced post testing so make sure to check out vintagequiltrevival.com. Love the yellow solid! Stopping by from the Linky party, VQR , block looks great. It was a fun and quick one. That brown floral print is one of my all time favorites! Pretty! Oh, fun! This is going to be great! Love it. Great block. That book looks like it will be in my library soon enough!